It’s great to see our artificial grass for dogs being enjoyed so much. Not only is it beneficial to the dogs, but it also makes the lives of those working at the doggy day care so much easier. Having artificial grass instead of a natural lawn means the staff at Scooby’s can concentrate fully on making sure the canines are well looked after; fed, watered and happy instead of doing things like mowing or weeding the lawn. And of course, as we’re in Britain and it has been raining today, the poor staff won’t have to battle with a swamp of mud that would no doubt appear with a natural lawn. That means no chasing around muddy pups and no muddy paw prints inside! I bet they’re thinking the artificial grass is a God send. I think the football was a little too big for him to tackle! If you’re interested in our artificial grass for dogs then please don’t hesitate to get in contact with us. As you can see, man’s best friend absolutely loves the artificial grass and like we said, it makes your life, as a pet owner, or a doggy play centre, infinitely easier. 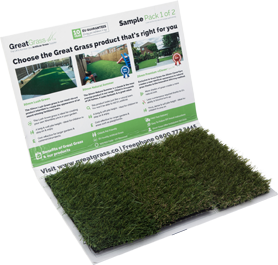 You can even order some free samples to see which type of artificial grass your dog likes best.